Anxiety. Concern. Frustration. Twitchiness. Thesauruses (or is it thesauri?) would have been out in full force on Wednesday night at the Spanish capital. Five games into the new season, surprise, surprise, FC Barcelona, which was supposedly in the midst of a crisis last month, find themselves two points clear on top of the La Liga table. Seventeen goals scored. Two conceded. Neymar, who? Sevilla, Atletico Madrid, Valencia, Levante and Real Sociedad follow them in the league table. Further down in eighth place, in a mid-table position is their eternal rival from the capital, Real Madrid. Above Real Madrid are Real Betis, the team that beat them at the Santiago Bernabeu with a goal right at the death. At this stage of the league with five matchdays done, Real Madrid are already seven points behind Barcelona. This point gap puts it out of the realm of gaining any advantage on head to head fixtures (league positions at the end of the season in the Spanish La Liga are decided on the basis of head to head fixtures rather than goal difference) of the El Clasico. Just a month ago, Real were basking in the adulation post their domestic and European league double, and drubbing both Manchester United and Barcelona to win UEFA Super Cup and Spanish Super Cup respectively. To call it an inability to score goals is rather simplistic. No doubt, it has hurt them. But the reality is a lot more nuanced, and is a combination of several factors. It is true that a majority of the players that won the club’s 10th UEFA Champions League in 2014 are still on the payrolls of the club. It is also true that the club has made some impressive young signings to steal a march on its domestic and continental rivals. But squad depth wise, the team has been hit where it hurts them the most. In an earlier article, this author had noted that departures of James Rodriguez and Alvaro Morata from the club would rob them of their cutting edge. In the previous season, both these players were on-call options from the bench, contributing to 31 of the 173 competitive goals scored by the team. 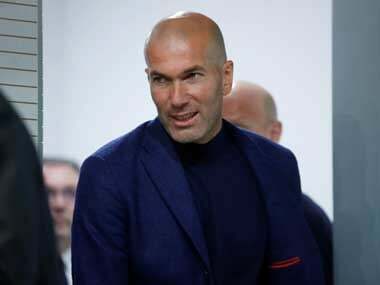 They were the crucial reason why Real Madrid could rotate their players without any discernible loss of squad quality, and they contributed crucial goals all through the successful campaign. The attacking midfield slot is still ably served, but the absence of credible cover at the striker position has come to bite them early on in the campaign. Particularly, Alvaro Morata’s 20 goals up front will be hard to replace. 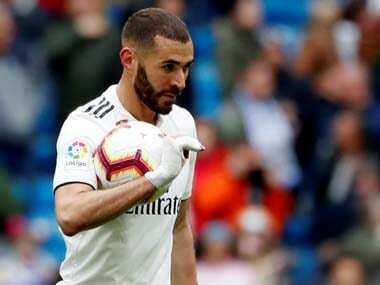 Injury to Karim Benzema hasn’t helped the cause. Benzema, who recently signed a contract extension, is a key member of the squad who brings other teammates into play by dragging out defenders out of position. The parting shot at the Vicente Calderon (which led to an Isco goal) which effectively snuffed out Atletico Madrid’s challenge in the Champions league is a typical example of how the French forward operates. 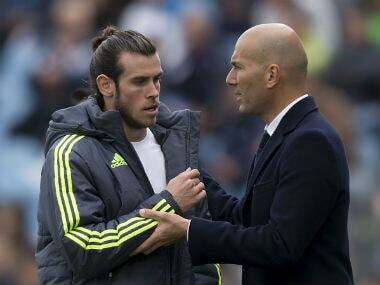 Additionally, Gareth Bale isn’t back to his best yet, and this has robbed the team of some finishing ability up front. Suspensions have affected Real Madrid as well. Most importantly, Cristiano Ronaldo missing four league games. Ronaldo, even at his age, still guarantees about a goal per game, and his absence no doubt dented their chances to score some goals. The backup forward, Borja Mayoral, is a young striker with decent potential, but he cannot be expected to reach either Benzema’s or Morata’s level as he is only 20. It mustn’t be forgotten that even the 24-year-old Morata had his first prolific scoring season only last year. Heaping unnecessary expectations on the young shoulders of Mayoral will only be detrimental to Real Madrid’s cause. The pressure of playing at the Bernabeu is partly to blame for the situation the team finds itself in. The Real Madrid fans are known to be notoriously fickle, and difficult to please, to put it mildly. Apart from winning every game comfortably, a sense of style and panache is expected out of the team. Kurt Cobain might have crooned “Here we are now, entertain us” in a Nirvana song, but this is most applicable to Real Madrid fans who often wave white handkerchiefs to show their displeasure at the team. 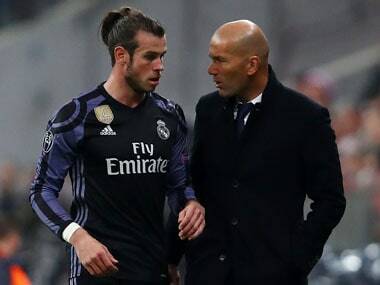 Unlike the English fans who are known to egg on, vocally encourage and applaud a clearance, even, many famous players, Zidane included, have been booed at Real Madrid. One of the targets of the home “boo boys” has been Gareth Bale, who hasn’t scored at home since February. No doubt, this attitude of the fans leads to the anxiety of playing at home. These are still early days, but Real Madrid have played better away than at home this season. Whether the team playing well or the spectator support comes first is a bit of an egg and chicken problem. The anxiety factor has so far made its mark. In the three games played by Real Madrid at home, the team has amassed 57 shots in total, but it has managed to score only three goals so far. To add insult to injury, five of these shots have hit the woodwork, further frustrating the home team. This was a team that scored for 74 games straight, and only drew a blank this time (27 shots, hitting the woodwork twice). To focus on the attack alone is not enough; the team scored the last two games at home but were unable to keep a clean sheet. The only consolation so far is that Barcelona aren’t the team of old. In the Pep Guardiola-Jose Mourinho era, the Spanish league was won with a nearly 100 point total. Last year’s winning total was 93 points, a deficit of 21 points from the maximum, and Real Madrid dropped points in four home games. It was their away record which picked up the slack. They also need to keep in mind that Barcelona have an inferior squad (even more so with Dembele’s injury) and the South American World Cup qualifying schedule is bound to play havoc. Additionally, the threat of a play-off looms large for Argentina, and this would mean an additional two games for Lionel Messi and Javier Mascherano. These might or might not have a bearing on league results, but the home results mean that Real Madrid have lesser margin for error in the forthcoming league fixtures; tough Champions League group games and a defence of the Club World Cup also lie in wait in the coming months. In all, Real should look to emerge first from the UCL group, defend its Club World Cup title and come within touching distance of Barcelona by the winter break. Larger challenges await them in the new year.